Joseph Mallord William Turner (1775–1851), Ancient Italy - Ovid Banished from Rome (1838), oil on canvas, 94.6 x 125 cm, Private collection. Wikimedia Commons. I have written a lot here about the writings of the Augustan Roman poet Ovid – his Metamorphoses and latterly his Heroides – and how they have inspired so many major and less well-known paintings. But I have said nothing about Ovid himself. This article looks briefly at what we know about him, and shows how that has been reflected in paintings. The poet known throughout the world now as Ovid bore the full name of Publius Ovidius Naso: Publius was his praenomen, or first name, which was given to him by his parents at a purification ritual nine days after his birth. Unlike in modern societies, there were only around eighteen different first names available to Romans at that time, and many were almost pre-determined by birth order, etc. Ovidius was his nomen, which corresponds more to a Western surname, as it indicates his family or clan. The Ovidius family were soldier-farmers who owned quite large estates in the valleys around Sulmo (the modern town of Sulmona), in the Apennines to the east of Rome, where Ovid was born. As such, they were not properly Romans, but had aligned themselves with the Roman state and as a result had been assimilated into its social order and institutions. Naso, meaning ‘nose’, was his cognomen, a nickname which had been acquired by the family at some time in the past. In this case, one of his ancestors had probably had a prominent nose. Coming from the lesser country aristocracy, he received a good education, and his father expected him to aim for a career in law and probably politics. But these were turbulent times: Ovid was born in 43 BCE, the year after the assassination of Julius Caesar, the end of the Republic, and the start of civil wars which led to the new political order of Augustus, the first Roman Emperor who ruled from 27 BCE until 14 CE. Ovid was sent to Rome, where he was educated mainly in rhetoric, and started in some public posts at the foot of the ladder which led to his expected career. However, when he was only eighteen, he entered literary and poetic circles, and made his first public recitation. He travelled to Greece, Asia Minor, and Sicily, and soon renounced a legal career to become a poet – against his father’s wishes. Over the next twenty-five years or so, Ovid wrote some of the most important literary works of the time, following those of Virgil, who died in 19 BCE. These explored love and human relationships (Heroides, Amores, and Ars Amatoria), and myth (Metamorphoses and Fasti), which were all written in verse. Apart from Metamorphoses, which was written in hexameter, Ovid wrote primarily in elegiac meter. His poetry was thus intended principally for recitation and reading out loud, when its rhythms and poetic language would be most apparent and appreciated. Although this was over a millenium before the invention of printing, Ovid’s works were very popular, and copies were sold to many individuals and to Roman libraries. Nicolas Poussin (1594–1665), The Triumph of Ovid (c 1624-25), oil on canvas, 148 x 176 cm, Galleria Nazionale d’Arte Antica, Rome. Wikimedia Commons. 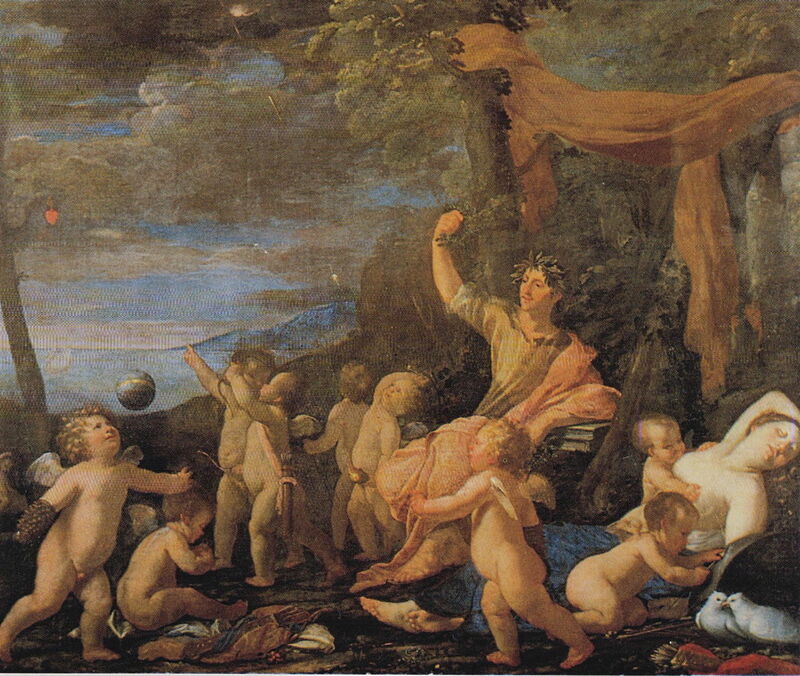 Poussin, who painted a large number of works which told stories from Metamorphoses in particular, made his tribute to the poet in The Triumph of Ovid in about 1624-25. Surrounded by Cupids and amorini, Ovid leans against books of his works, and holds high the laurel of achievement. At the right, a woman is asleep, one infant suckling at her breast. I’m unsure whether she is intended to represent one of Ovid’s three wives, or a character from his myths. Ovid’s poetry was in many respects quite radical. Interpretations of his Metamorphoses remain controversial: superficially it appears laudatory of the emperor Augustus, but there are signs of deeper critical intent; there is more consensus that it is critical of Virgil. Ovid’s love poetry was, though, a more flagrant challenge to the rule of Augustus, who had established adultery as both a private and public crime in 18-17 BCE. Any encouragement of relationships which went beyond the confines of marriage was thus an obvious target. In 8 BCE, the emperor Augustus suddenly banished Ovid to the far north-east of the Roman empire. The only account of this is Ovid’s, in which he gives two reasons: one was his (love) poetry, the other what Ovid refers to as a ‘mistake’, but does not detail further. Despite extensive and imaginative speculation, no one knows what ‘mistake’ might have offended the emperor so deeply. Joseph Mallord William Turner (1775–1851), Ancient Italy – Ovid Banished from Rome (1838), oil on canvas, 94.6 x 125 cm, Private collection. Wikimedia Commons. 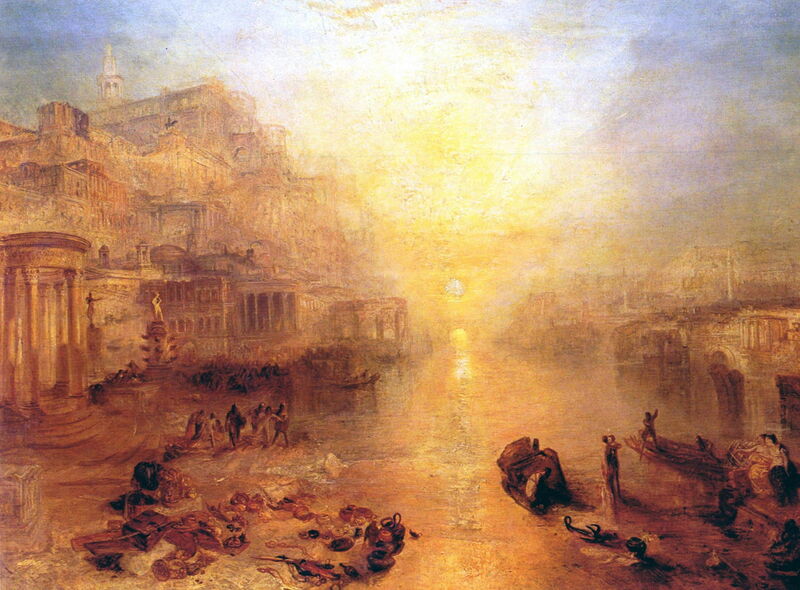 JMW Turner’s magnificent painting Ancient Italy – Ovid Banished from Rome exhibited in 1838 is strongly reminiscent of Claude Lorrain’s contre-jour dusk riverscapes, and gives a thoroughly romantic view of departure by boat from the bank of the Tiber. Turner may not be as well known now for his paintings of Ovidian myths, but at the time they had formed a central part of his work. Ovid travelled by boat and overland until he reached the eastern coast of the Black Sea at what was then Tomis, now the Romanian holiday resort of Constanța. By this time, Tomis was a well-established city which had developed over a period of more than five hundred years. The area had been annexed by the Romans in 29 BCE, and was still at the far frontier of the empire: travelling just a little further north along the coast you would have reached Roman forces defending the territory against hostile tribes. The local Scythians seemed more content with their place in the empire, though, and Ovid appears to have been among friends, just not those of his choosing. His third wife remained back in Rome, and Ovid had to live in a largely non-Latin-speaking society with no access to libraries. 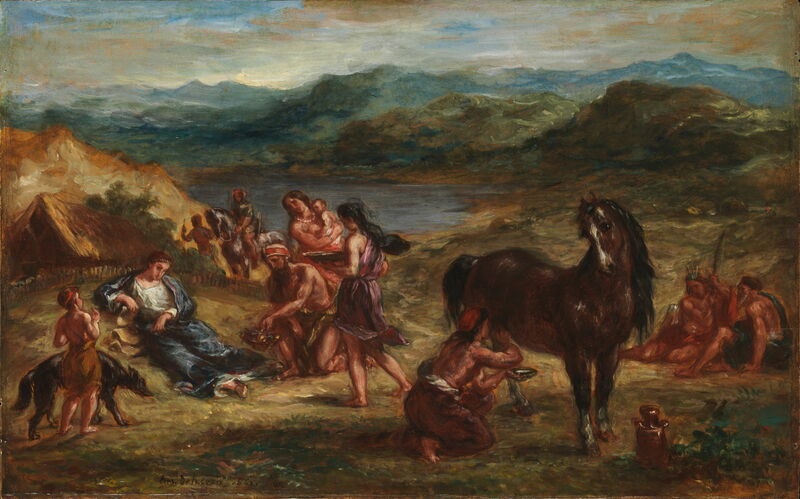 Ovid’s predicament was a lasting inspiration to Eugène Delacroix, who first started to develop paintings of it around 1835. His first known painting showing Ovid in exile was completed in 1844, for the ceiling of the Library of the Palais Bourbon in Paris. 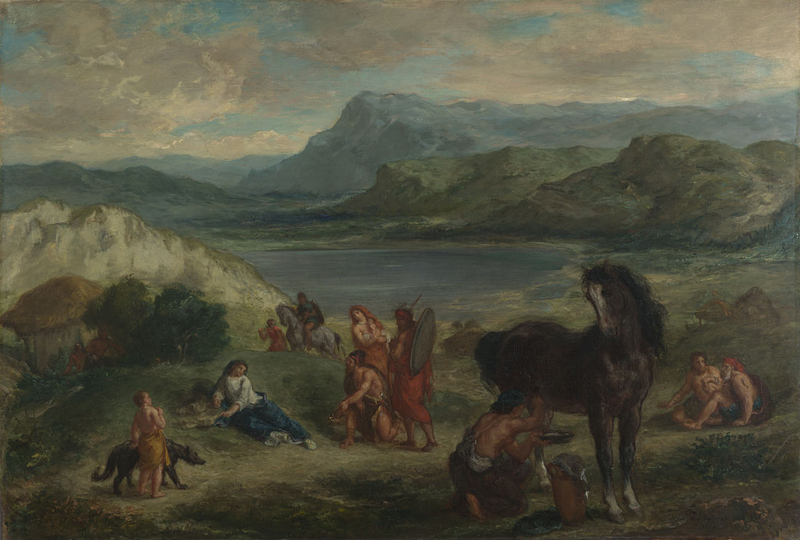 Eugène Delacroix (1798–1863), Ovid among the Scythians (1859), oil on canvas, 87.6 x 130.2 cm, The National Gallery (Bought, 1956), London. Image courtesy of and © 2017 The National Gallery. In 1859, as he neared the end of his career, Delacroix painted Ovid among the Scythians. He shows Tomis as a rural and primitive area on a narrow coastal plain amid rugged, hilly country. The Scythians follow their legendary reputation of living on mare’s milk – as demonstrated by the barebacked local milking a mare in the right foreground. When exhibited at the Salon that year, Delacroix’s painting drew considerable criticism for its unusual composition and the small scale of its figures. Eugène Delacroix (1798–1863), Ovid among the Scythians (1862), oil on paper mounted on wood, 32.1 × 50.2 cm, The Metropolitan Museum of Art, New York, NY. Wikimedia Commons. Just a year before his death in 1863, Delacroix tried again with this variation of Ovid among the Scythians, which alters the composition and enlarges the figures. Although wonderfully painterly and rich in colour, it remains very romantic and embroiders the myth which Ovid had started to create in his writings from exile. Ion Theodorescu-Sion (1882–1939), Ovid in Exile (1915), oil on cardboard, 36.5 x 43.5 cm, location not known. Wikimedia Commons. 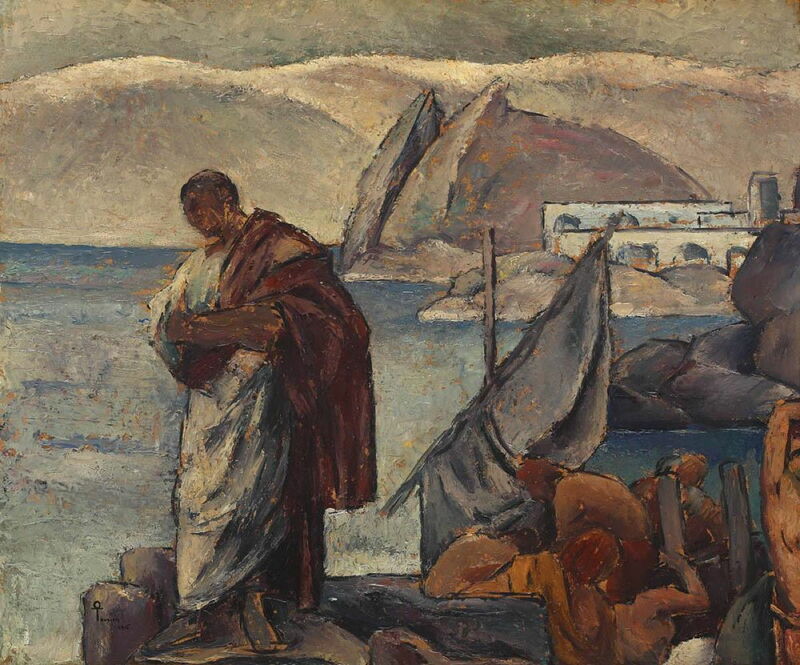 The Romanian artist Ion Theodorescu-Sion’s version of Ovid in Exile (1915) appears much more realistic, showing Tomis with more substantial buildings and a port. Deprived of a library, Ovid was unable to complete his detailed account of the Roman calendar which he had started in his Fasti, but he did continue writing. His Tristia and Epistulae ex Ponto from those years in Tomis provide the only real information which we have about his life. He died there in 17 or 18 CE, his many poetic appeals to the emperor for clemency unheeded. 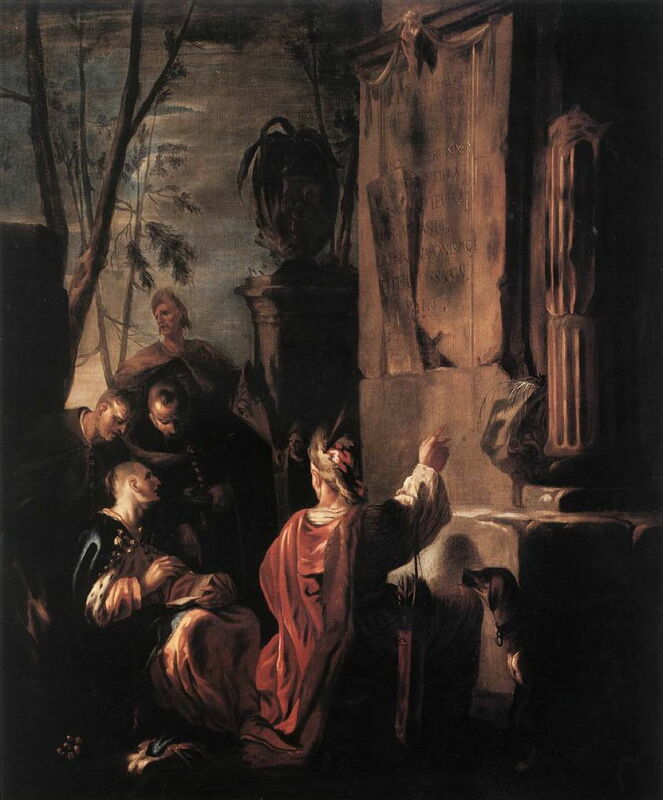 Johann Heinrich Schönfeld (1609–1684), Scythians at the Tomb of Ovid (c 1640), oil, dimensions not known, Szépművészeti Múzeum, Budapest, Hungary. Wikimedia Commons. Johann Heinrich Schönfeld’s Scythians at the Tomb of Ovid (c 1640) shows an imaginary scene of local Scythians paying homage to Ovid’s tomb. Unlike Delacroix’s depictions of them as friendly barbarians, Schönfeld comes closer to the truth, I suspect. If you wish to read more about Ovid’s life, I recommend Diane Middlebrook’s posthumous and sadly incomplete Young Ovid. Although it stops short of his exile, and relies heavily on supposition rather than evidence, it is rich in detail and compelling reading. Boyd, Barbara W (ed) (2002) Brill’s Companion to Ovid, Brill. ISBN 978 90 04 22676 0. Hardie, Philip (2002) The Cambridge Companion to Ovid, Cambridge UP. ISBN 978 0 521 77528 1. Knox, Peter E (ed) (2009, 2013) A Companion to Ovid, Wiley-Blackwell. ISBN 978 1 118 45134 2. Middlebrook, Diane (2014) Young Ovid, an Unfinished Biography, Counterpoint. ISBN 978 1 61902 331 4. Posted in General, Language, Life, Painting and tagged Delacroix, narrative, Ovid, painting, Poussin, Turner. Bookmark the permalink.